My attempt to analyse and provide informative, thoughtful, balanced news and views, often from a left of centre perspective. READERS ARE URGED TO COMMENT AND FOLLOW BY EMAIL OR OTHER LINKS. SEE SIDEBAR. YOUR SUPPORT IS VITAL. A titanic struggle looms between the old and new orders in Fiji for the hearts and minds of the indigenous majority – the i’taukei. It’s a struggle that will determine the future for all Fiji citizens and on present indications, the portents don’t look good. Because the old order – the i’taukei chiefs – seem determined to make race the centerpiece of their campaign, to mine all the old prejudices that have retarded independent Fiji’s development right from the start. The evidence for this is an astonishing letter to the self-proclaimed leader of the “New Order” – Prime Minister Frank Bainimarama – from one of the country’s paramount chiefs –Ro Teimumu Kepa – in which she raises the spectre of “racial calamity” in Fiji. The phrase has sent a chill through the ranks of non-indigenous Fijians, which comprise 40 per cent of the population. Because however much Bainimarama assures them of a bright multiracial future, the old racial skeletons are being rattled at the apex of indigenous society. Ro Teimumu heads one of the three indigenous confederacies – Burebasaqa – and carries the title Roko Tui Dreketi, which she inherited on the death of Ro Lady Lala Mara, the wife of the founder of modern Fiji and multiracial standard bearer, Ratu Sir Kamisese Mara. From her base in Rewa, outside Suva, Ro Teimumu appears to have embraced the mantle of warrior chieftain – the Boadicea of the South Seas – taking it upon herself to confront Bainimarama head on. Her immediate casus belli is Bainimarama’s sudden and unilateral decision to disband Fiji’s Great Council of Chiefs (GCC), depriving it of its previous status in national life and abrogating its power to, among other things, appoint the country’s president. Chiefs high and low are in revolt, not only over their loss of status and Bainimarama’s lese majeste but also a loss of income as the government bypasses them and channels funding direct to the grass roots. It’s damaged both their pride and their pockets. And many Fijians wonder whether Bainimarama – who’s emerged as the ultimate exponent of the “crash through or crash” brand of reform – may have finally overplayed his hand. In any event, he’s now been dealt an unwelcome racial card. 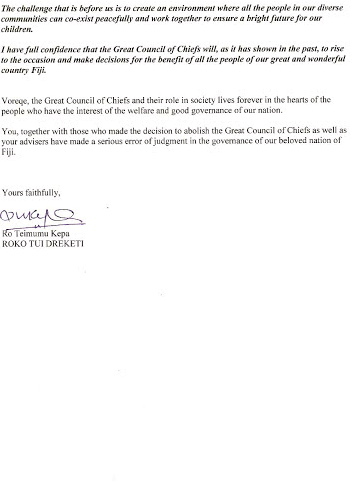 In her letter -in which she provocatively addresses the Prime Minister as “Voreqe”, his indigenous Christian name – Ro Teimumu describes his decision to abolish the GCC as “ a serious error of judgment”. “Despite the shallow criticisms against the role of traditional chiefs, they are the stabilizing factor for Fiji and they have helped to control the ethno-nationalism and facilitate conciliation in ethnic relations in Fiji”, she states. Ro Teimumu continues with a broad attack on a central pillar of Bainimarama’s rule – his multiracial agenda. This includes a level electoral playing field when promised elections are held and the use of the term Fijian to describe all citizens and not just the indigenous majority. “The obsession to remove racial issues from the governance of this country is short-sighted and ill-conceived, for ethnicity is a fact of life”, Ro Teimumu says. “The revolutionary changes you are making cannot be made without the involvement of the GCC. Any calamity between the races or even between indigenous Fijians themselves can only be resolved with the involvement of the GCC”, she declares. In the Fiji context, such a statement from one of the three most senior chiefs in the country has very serious implications. Is Ro Teimumu signaling that without the formal involvement of the chiefs in national life, racial calamity is inevitable? Many will note her choice of the word calamity. Racial stresses, even tensions, have long been a fact of life in Fiji. But racial disaster involving great distress and great suffering – the accepted meaning of calamity? Nothing can be more designed to provoke unease and erode community confidence. The wider concern is whether this statement has the potential to incite racial hatred and trigger racial conflict in the vanua – especially those areas of indigenous life over which the chiefs still hold great sway, however much their power has been eroded. In the immediate aftermath of previous coups, a wave of home invasions and bashings descended on Indo-Fijians living in certain parts of the country. Some of it was described as institutionalised violence, in which the authorities allegedly turned a blind eye to flagrant human rights abuses. Bainimarama has promised the country this will never happen again. But can the racial minorities in Fiji ever take him at his word when a paramount chief invokes the spectre of a “calamitous” reprise? Ro Teimumu is a formidable opponent – resentful not just of Bainimarama’s truncation of chiefly privileges but from having been a minister in the pro-indigenous SDL government that he removed at gunpoint in 2006. Far from going quietly, she’s been a persistent critic of the regime ever since, forging close ties with the leaders of that other pillar of opposition to the Bainimarama regime – the Methodist Church. In 2009, she was arrested for defying the military’s ban on the Methodist Church holding its annual conference. She offered to host it herself in Rewa village and was charged with inciting disobedience when she encouraged church members to attend. Since then, relations between the GCC and the Church have become even closer. 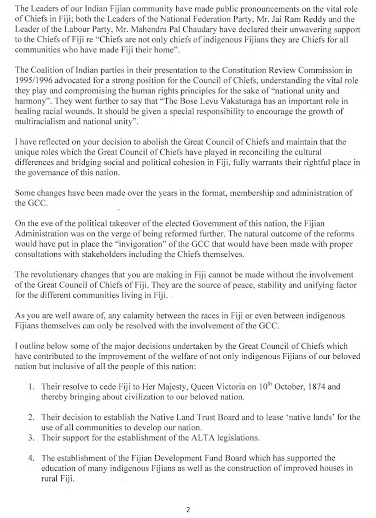 The Methodists have strongly criticised the abrogation of the GCC and both cast themselves as the sole remaining bulwarks against Bainimarama’s perceived threat to the indigenous way of life. Ro Teimumu’s latest missive to the prime minister was the second within days and followed a letter of protest over what she termed the environmental threat posed by the proposed Namosi copper mine outside Suva. That can fairly be cast as the legitimate right of a traditional chief to safeguard the interests of her people. But raising the prospect of racial conflict in an already volatile wider environment? Even on prominent anti-government blogs like Coup 4.5, Ro Teimumu’s comments have generated a wave of criticism. One correspondent there termed it “the last gasp of the old order in Fiji” and said even talking about racial calamity made her “unfit to hold any responsible position in national life”. How the regime will respond is yet to be seen. But Ro Teimumu has emerged as arguably the most potent opposition leader in Fiji – the principal standard bearer for the chiefs, the Methodist Church and the many thousands of traditional indigenous Fijians they still claim to represent. The old Fiji versus the new. Could Graham Davis remind us again who voted for Bainamarama and his junta party? I remain unconvinced that gaining power by the bullet rather than the ballot is a step in the right direction. Great piece Graham. It exposes this 'regal' chief for what she really is. A classic case of how greedy, power hungry leaders put their pecuniary interests before national interest and breed racial hatred. 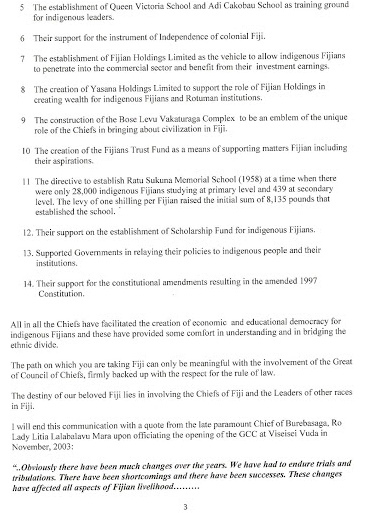 One of the reasons Fijian people as a whole are behind is because of chiefs like Teimumu. A bitter, hated-filled figure using her chiefly status and church connections to stir trouble. She wasn’t effective as a minister in the corrupt Qarase govt; but then she got to that position because of her chiefly status, not her abilities. Obviously angered by loss of status and financial privileges which she is desperately trying to regain.Happy to rouse her people and send them to face the bullets if it comes to that. None of her people will gain anything but at least she will be back on a fat undeserved salary. 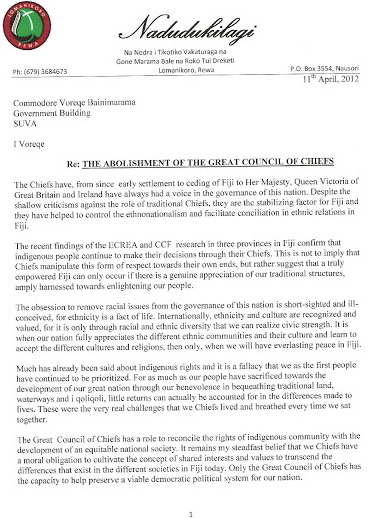 This is classic example of how chiefs use the people for their own gain in Fiji. Very un-chiefly and very unchristian behaviour to spread hate and evil, Teimumu. Stop deceiving and using your people. It is disgusting. Well she may as well give it a nudge, given the behaviour of the current lot. To me it seems quite obvious that we are entering a critical phase in the battle for Fiji’s future. While I certainly do not condone the prospect of racial calamity, the risk of a major backlash should not be underestimated. And the more the regime constraints inclusive dialogue, the more it hassles critics such as Ro Teimumu and Mere Samisoni the higher the risk for something calamitous to happen. While I understand the desire of the regime to protect itself from opposition, the reality is that the nation sits on a pressure cooker building steam for quite some time now. It seems unlikely that the regime will convince many that it has managed the economy well. Blaming international financial woes will not convince anyone who sees the rapid decline of Fiji’s sugar industry, still a major employer and revenue generator. And I have not really come across anyone outside the regime who really believes that making friends with China is an adequate substitute for the traditional relationship with Australia, New Zealand and the EU. At Suva’s underbelly the negative impacts of the new friendship with China is all to clear to see in the illegal gambling outfits, drug pushing and prostitution rackets. In addition, the facts clearly show that Fiji in the meantime lags behind her neighbours in the region and the effects of stagnation and recession are felt by an ever-increasing part of the population. Authoritarian regimes can traditionally survive for long periods when there is enough money to go around as the case of Libya has demonstrated. But a combination of economic stagnation and political repression is a recipe for calamity of the serious order, even in a society that has up until now proven to be quite docile and indolent. I sincerely hope that the regime sees the warning signs and allows open and free dialogue on the future of Fiji. A good start would be to reflect, if it was such a wise decision to pre-empt an open consultation by officially abrogating the GCC just ahead of the start of the process of developing a new constitution. The GCC has been a constitutional body after all and I can imagine a number of ways to pull it into the 21st century instead of using the battle-axe. The signal that was send by this move was loud and clear, as is the harassment of critics such as Samisoni with gagging and special purpose decrees. Such moves do not suggest that we have a confident government in place that takes the ensuing consultation on Fiji’s future seriously. It would also be a great relieve if the PM could state in an unambiguous way what his ambitions and personal role in the political future of Fiji will be. Responding to this question with a lame “I don’t know” won’t cut it for most of us. "Real freedom is freedom from fear, and unless you can live free from fear you cannot live a dignified human life". To all sides of the argument, combatants in this battle for posterity, surely this is the only outcome that must prevail? Freedom from fear and human dignity. The means to achieve this are what count. 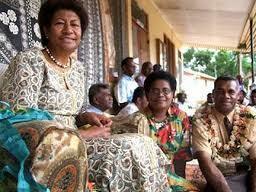 Enslaving people, forcing them into a servitude of mind and will has produced the monster of racism in Fiji. There can and will be no lasting Peace through imposition of one kind of servitude for another. So, calamity has been our lot for centuries. Calamity beckons yet. The resistance of the Fijian people to a Saga of Calamity is impressive and must endure. I agree with Paula fully. A very clearly argued scenario which the regime should reflect on. I think the PM acted too hastily and too soon. It might have been more expedient to present the case to the people, including the chiefs and then submit the findings to the team developing the new constitution. I agree with Ro Teimumu that this was a serious error of judgement. If the PM has plans to replace the GCC with a similar but less political body then he should let the people know immediately, not sometime down the line. I also agree with Paula that he should declare very clearly if or not he will run for office. It's a serious matter so he should not just waffle. If you make your own bed then be prepared to sleep in it. There is no way those that have committed treason, or those stupid enough to support them, will get away with it without severe punishment. Are they that blind to history or in total denial what is coming to them? As elsewhere in the world where people have regained their freedom and democracy - take it on the chin! For those of you who do not know, Ro Teimumu Kepa is younger sister of Ratu Sir Kamisese Mara’s wife (Ro Lady Lala Mara), and maternal aunt of Ratu Ului Tevita Mara, the former military man and the runaway fishing chief who I understand, now has shelter in Australia. She was Minister for Education in Qarase’s racist and supposedly democratic government (2001-2006) which administered blatantly racist policy of free form seven education for Indigenous Fijians only, solely based on race with no means test. That means an indigenous Fijian Permanent Secretary (most were those days, still are today) with high paid wife with total combined income of over $100,000 could have their child in form seven free. However a displaced Indo Fijian cane farmer or a labourer with mere $5,000 pa income would have had to pay for their child’s education in form 7. That was democracy Fiji –style and this so-called Chief administered that policy. Fiji suffered because of many of such Chiefs who lined their pockets and now no longer have access to state till, racist governments or an undemocratic Chiefly aristocracy. She is using her contact with equally racist and non-Christian Methodist Church which preached racial hatred from pulpits. Hence her letter has to be read with a pinch of salt and some butter-chicken sauce. Yes, the catalogue of evil inequity is a weighty tome indeed. There are many of us not necessarily cane farmers who paid our taxes only to have them support a greedy, grasping "must have it all" lot and then paid for our own children to be educated far away from Fiji entirely from our own pockets: no alternative and no tax incentives for it. Australia shut them out: no visas then for primary or secondary school children born in Fiji: black or white! New Zealand not much better: they had a quota of 18per annum. Thank heaven for grandparents UK-born who conferred a right to education in the United Kingdom for Fiji-born grandchildren. Now that IS equity! It was and is still a superior way of doing things where access to all levels of education is concerned (private or public). A "Cut Above the Rest" then. So Fiji taxation was abused and misused in a 'grabfest' for the few? Fortunately, so many who elbowed their way in, failed not only the policy but also their studies. Nothing worthwhile is ever swept-up for free in this life especially when it is attained at others' egregious expense. Many never learned the art of living with grace and good taste. Instead, they took up duplicity and lies and frightful, over-marketed 'hot stuff'. The JW Blue Label elite set. Happily shouting "Bottoms Up" while the West went under flash floods for the third time in as many months. My, how the 'hoi oligoi' live! Shall we ever forgive and forget? "Toward the end of the nineteenth century we come face to face for the first time with a unique phenomenon which, more than any other single factor, has influenced the course of Jewish history since 1850. This is the phenomenon of anti-Semitism. We must understand not only its nature but also its origins, because the mixture of anti-Semitism, nationalism and racism created the barbarism of our age and was responsible for the mass murder of five million Jews. When and why did it originate? What is its nature? How did it spread?" He also has this to add: "The French Revolution left Jewish emancipation as a residue on the bottom of the revolutionary crucible. As Napoleon's armies advanced, the walls of the ghetto crumbled. But, mercifully, the emancipated Jews were unaware of the assault to be made upon them by a new degeneracy of man - racism". "A new degeneracy of man"? But in Fiji this monster of racism incarnate emerged when? What studies have been made of this phenomenon? Is it an innate characteristic? Presumable not, Ma'afu after all lived for many years within Fiji and not only as a conquering warlord. Why have we been so recalcitrant in making a full historcal analysis of the emergence of this corrosive horror? @ Liu Muri... all i can say is whatever the faults of Qarase, he was installed by the regime in all their collective wisdom, wasn't he?? They haven't had good track record for reformers have they, Chaudry too !! I didn't know this place existed, but hey yes I agree with some of the comments laid out above.. She wants her status back with the perks..no way...GCC now we don't need you anymore!! as there is no accountability for how your money is being spent by the current regime, i am a little surprised at the smears aimed at the chiefs. Perhaps when this military actually stick to a budget and doesn't award themselves backpay or get themselves a cushy job, they and their supporters will be able to lecture others. You bleat about how broke the system under the GCC was, but expect nothing from the military? When was the last time you saw an audit report on how this junta spends your money? Rattling the old racial skeletons, Croz? So the dreary word 'pogrom' has raised its ugly head? Back to 2000and the use of 'Beyond the Pale'? The proper place for all 'vulagi' in Fiji? Reminiscent of the British adage: "Know your place"! Let us dwell on Russia (where the pogroms first took off). "The Russian people countered terror with terror. ..The new Czar (Alexander III) was completely in the hands of the aristocrats, who could see no further than their privileges. Their leader was Pobedonostsev, head of the Holy Synod, a Slavophile who looked upon democracy as a leprous disease and upon voting as dangerous. It was he who instituted the pogroms, officially sponsored uprisings against the Jews as tactics to divert the Russians from their miseries. His formula for solving the "Jewish question" was "one third conversion, one third emigration, and one third starvation". The pogroms he encouraged were a diversion for the masses, like the circuses of the Romans, but instead of tossing Christians to the Lions he tossed Jews to the peasants. A series of such calculated pogroms erupted all over Russia and the entire world protested. Twenty thousand Jews were expelled from Moscow. Jews emigrated by the hundreds of thousands to the United States, which still had unrestricted immigration. But the millions for whom there was no avenue of escape lived in fear and poverty. There is much here of relevance to our present situation. We should all think carefully of what seems particular to ourselves. For no one else will! Thousands have already poured out of Fiji through policies of deliberate ethnic-cleansing. More would be going now if they could: no passports. How convenient! But daily there are those who say covertly "we are off"! Yesterday one 85 year old lady confided " I've had enough"! Under Joseph Stalin millions more Russians starved to death not as the result of warfare in World War Two but through policies as targeted as those of his Imperial predecessors were. We need to know our history! "The March of Folly" has told us that we must. Barbara Tuchman calls to us still. The sum of human folly is starvation and death: the collateral damage of applying wholesale (in lieu of piecemeal) social engineering. We have met with Jews in the USA whose mothers and fathers fled from the Pale in Russian and Polish pogroms. Their American-born children are living witnesses still to the horrors endured by their parents. It must never, ever happen again! Yet North Korea and Syria are bent on just that - now. Romanovs, Bourbons and Jews? I'm trying to see how this has anything to do with Fiji but am having a lot of trouble. "....Having a lot of trouble?" Well now, take yourself back to the year 2000: May to be precise. Take yourself back to Muaniweni and the attacks made on 19th May: not unlike a 'pogrom' waged on Jewish ghetto dwellers? But this was Fiji, not too far from Suva. We visited and spoke at length with those who fled from Muaniweni for safety after spending three petrifying days and nights in the jungle. One was absolutely convinced then and we remain so to this day: what took place there was orchestrated terrorism. An affidavit sworn for the Court of Appeal Hearing in February 2001 attests to that fact. It was read out in part by Geoffrey Robertson QC. Along with many others. Now do you "get it"? Your trouble is of your own manufacture. Those who deliver and wage terror will be assailed by the fall-out from terror for the rest of their days. Living 'Beyond the Pale' is nothing new. And the Jewish People may attest to that. The March of Folly goes on. Only the wilfully ignorant fail to grasp this? Sorry where is the pressure cooker apart from the Ro lady? And her privileged lot? I know that the theory of major back lash, together with the theory of civil uprising and the theory of political unrest, have been keeping the diplomatic corps in a state of hope for years, but I haven't seen any sign of any such event? Other than poor old Mere who goes around painting slogans on public buildings? @Anon.. as opposed to the military being thinly disguised fascists who love the sound of their own voices a feel a right to oppress their own people? "The principles of free speech are fundamentally important in building society but ultimately we need to distinguish between speech that is delivered in ‘the private interests’ of individuals, groups, elites (or political parties for that matter) versus the public interests of society"
- the late Professor Ian Shirley. Why Are We So Unconcerned about Climate Change and Global Warming? Please use them all. "No comments" means not comments so far. It does NOT mean make no comments. You comments will make the blog more useful to others, so please COMMENT.